Eintracht Duisburg 1848 is an amateur football club from the city of Duisburg in North Rhine-Westfalia, Germany who have a rich history prior to the formation of the present club on the 1st July 1964 following a merger. The merger came from two old Dusiburg clubs; Duisburger Turngemeinde für Erwachsene von 1848, who were the predecessor of the Duisburger Spielverein, and TuS Duisburg 48/99. Duisburger Spielverein (Duisburger SpV) were one of the most successful German teams in the area after future DFB President Gottfried Hinz formed the club out of Duisburger TfE on the 22nd March 1900. The club moved into their Sportplatz am Grunewald in 1901. In 1902 the Rheinische Spiel-Verband (Rhine FA) was set up, with the club being placed in Klasse des 3. A year later ‘Rotblusen’, as the club were known for their red shirts, joined the DFB German FA. The team won the Westdeutsche Meisterschaft at the first attempt and progressed to the national final rounds, where they lost 2-1 to reigning champions VfB Leipzig in the last four. In 1905 DSV again reached the semi-final after a second Westdeutsche title, but they went out 5-1 to Stuttgarter Kickers. The Westdeutsche Spiel-Verband introduced a top flight Zehnerliga for the best clubs in the region in 1909. Duisburger won it in 1910 and 1911 with German internationals Lothar Budzinski-Kreth and Christian Schilling in the team, but both times they went out at the last eight stage of the national championship. In 1913 a fifth regional title was followed up with a run all the way to the national final, where they were defeated 3-1 by VfB Leipzig, with Heinrich Fischer scoring the consolation goal. The Zehnerliga title was collected once again in 1914. In 1918 Grunewald was required by the city for a new freight depot, so the club were forced to leave for a new home at Rheintörchenstraße in the Wanheimerort district of the city. After World War I, the regional championship was called the Spielverein. DSV lifted the championship crown in 1921, going on to the national final, where they fell 3-1 to Berliner FC Vorwärts. The district title was collected in 1924 and 1925, but the team didn’t go much further in the quest for a national title. The final Westmeisterschaft arrived at the club in 1927, before financial difficulties led to DSV slipping down the pecking order. The Third Reich introduced sixteen top flight Gauliga’s, but Duisburger were overlooked, before winning promotion in 1943 to Gauliga Niederrhein. At the end of World War Two, DSV were placed in the Bezirksliga Rechter Niederrhein. After a couple of near misses promotion was won via the play-offs in 1949 after seeing off the challenge from FV 08 Duisburg and VfL Benrath. In 1950-51 the team returned to the lower grade. Manager Fred Harthaus took the side back to Oberliga West in 1953. In 1954 the club moved to play matches at Wedaustadion. A decent finish in 1956-57 saw DVS narrowly miss out on reaching the national championship finals. Crowds dropped to around 13,000 before the club managed to qualify for the newly formed Regionalliga West in 1963. At the same time local rivals Meidericher, who would become known as MSV Duisburg), qualified for the top flight Bundesliga. DVS were struggling with a large debt as merger talks began. The other club in the merger to form Eintracht were a result of several mergers of their own. In 1899 Duisburger FK 1899 got together with SV Viktoria Duisburg to become Duisburger SV Viktoria. SV Borussia Duisburg and Duisburger TSV 1848 eventually became Duisburger TV 1848 who were placed in Gauliga Niederrhein, which was one of sixteen top divisions introduced during Third Reich rule, with German international Willy Busch in the team. In 1934 the team were relegated, before regaining their place three years later following wins over VfB Mühlheim and SpVg Odenkirchen in the play off rounds. A further merger followed a runners-up spot to Fortuna Düsseldorf as the club became TuS 48/99. In 1941/42 TuS were once again runners-up, this time behind Hamborn 07. After the War, TuS were placed in the Landesliga. A runners-up place behind VfB Bottrop in 1962-63 allowed TuS to qualify for the newly formed Regionalliga West for the next season, when merger talks would take place with DSV to form Eintracht Duisburg. Eintracht were faced with a tough task as next door neighbours MSV finished runners-up in the top flight Bundesliga just as the merger was complete. Financial difficulties blighted the new club before they dropped down to the Verbandsliga Niederrhein in 1967. They immediately won that title and won promotion after a play off round. A merger with MSV Duisburg and Hamborn 07 to form 1. FC Duisburg was discussed but never realised. In 1969 the club returned to the Verbandsliga, where they remained until 1976, when a succession of relegations found Eintracht in the local Kreisliga A, which was one of many national eighth tier leagues. The club has found itself around that level ever since, as a sporting club at the centre of the community with a proud background in fencing, athletics, handball, table tennis, gymnastics, badminton, street dance and tennis. 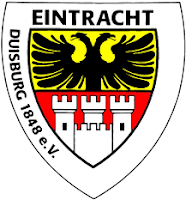 Eintracht Duisburg will play in the Kreisliga B Duisburg/Mülheim/Dinslaken, Gruppe 2 in the 2015-16 season. Following my visit to nearby Duisburger FV 08 I had taken a rather longer than intended route to Eintracht. The crowds were growing as I crossed under the autobahn at Wacholderstraße in readiness for the MSV match. I was getting a little concerned that I was pushing time before kick off, but in no time I was on Margaretenstraße and entering the clubhouse area at the stadium. Passing several clay tennis courts, I found myself by a bar where many fans were enjoying pre match beers alfresco. It wasn’t the proper entrance to get inside the arena, but it offered me all the views I required. Leichtathletikstadion, was as the name suggests, an athletic arena with a running track around the pitch. A fine covered seated stand ran down the right hand touchline. The opposite side was a few steps of open terracing. There was nothing of note behind either curves at the ends. Having taken my photos, I saw that the changing rooms were at this end of the arena, but the access gate, which also led to spectator access was locked. Not to worry, as I had everything that I had set out for. I headed along with the building crowds gathering at the turnstiles at the Schauinsland-Reisen- Arena for the lunchtime visit of St Pauli.